You may be surprised to learn that there are different types of hair loss, although they all do involve the loss of scalp or body hair. Hair loss in men is also known as alopecia. Quite often, men’s hair loss is caused by a genetic predisposition toward alopecia; however, environmental factors and underlying medical conditions can also contribute to hair loss in men. The most common type of alopecia in men is male pattern baldness. This type of hair loss is caused by genetic factors that lead to balding. Specifically, men with male pattern baldness inherit a heightened sensitivity to dihydrotestosterone (DHT). DHT adversely affects hair follicles by causing them to shrink. The follicle is the tiny hole in the skin in which the hair is located. As the follicle shrinks, the hair becomes thinner and finer. Eventually, a hair cannot grow in a miniaturized follicle, although the follicle itself does not die off. 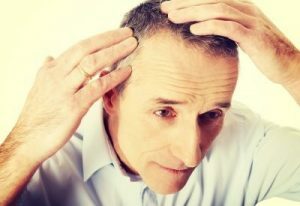 There are other potential causes of hair loss in men, including scalp infections, lichen planus, radiation therapy to the head, and severe physical or emotional shock. Regardless of the underlying causes of balding and thinning hair, there is no question that hair loss in men can cause significant psychological consequences. Men with hair loss may suffer from low self-esteem and poor self-image. They may become less socially outgoing and they may find it difficult to meet new people. Hair loss can even affect a man’s career. Men with a severely receding hairline or noticeable bald spots may be incorrectly perceived as being too old to perform certain job duties. Fortunately, there are a number of treatment options available for men with hair loss. Many men begin trying hair loss solutions such as topical creams and oral medications. Some might also try low-level laser therapy to stimulate hair regrowth. However, perhaps the most effective hair restoration option available is hair transplantation. Robotic Hair Restoration of Long Island offers the most technologically advanced hair transplant procedure with robotic “follicular unit extraction” (FUE) and robotic site-making for transplantation. Men with male pattern baldness should consider visiting Robotic Hair Restoration of Long Island to find out if a hair transplant could be right for them.